What do you like the most about the Summer Programs? D: I also like swimming in the pool when it’s really hot. W: Swimming in the pool. D: Belvedere. It’s really fun to hang out there and there are always lots of activities to do. W: Casa Fleming because that’s where my dad works and I like visiting him in the office. What is your favorite activity on campus? D: Music class with DPAT. W: Art class with the Minnows. What’s the best off-campus trip/activity you’ve been on? D: Parco Ciani in downtown Lugano. W: The Transportation Museum in Lucerne. What new skills have you learned so far? D: My writing has gotten much better since I came to CDE. Natasha, 13, is from Japan and the US and has been an MSP student for two years. Karolina, 13, is from Latvia has also spent two years with MSP. Matteo, 11, is from Italy and enjoyed his first year as an MSP student. N: Meeting new people from different countries. K: I love meeting new people. M: I like my friends here. Everyone is really nice and friendly. N: By the gazebo because it’s a nice shaded area to hang out. K: The large open grass area near the basketball courts. M: I love the swimming pool. What’s your favorite activity on campus? N: Evening activities because the games we play are really fun. K: Evening activities are always fun—there’s something different every night. M: Playing with my friends on the field and the basketball courts. N: Zermatt in the Swiss Alps—it was so beautiful. K: I loved all of the overnight trips, but my favorite one was going to the Italian Riviera. M: We went to a canyon and that was really cool and a lot of fun. 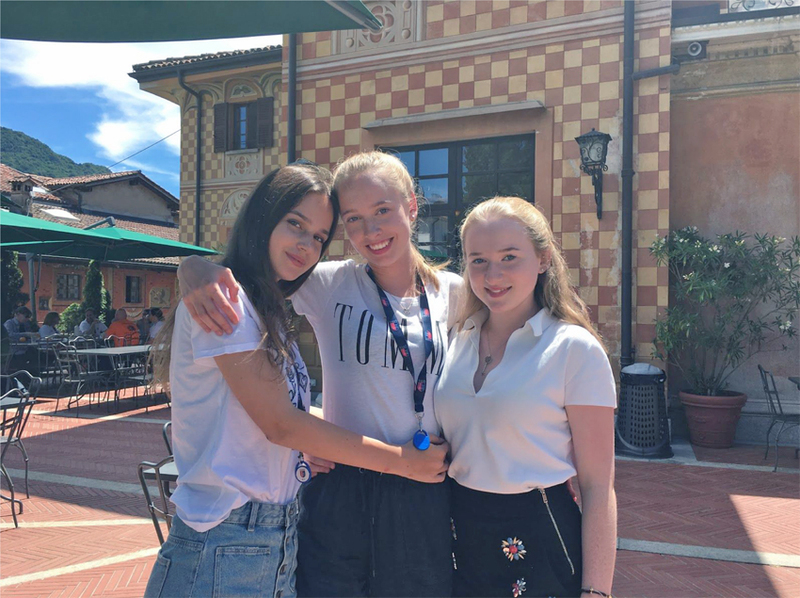 Anna, 17, and Maria, 17, are both from Russia and have spent four summers with TSP. Hannah, 14, is from the Dominican Republic and just finished her first year as a TSP student. A: Making new friends from all over the world. M: Meeting people and spending the summer in such a beautiful place. H: There are many great things about the summer program, but meeting new people from so many different countries is definitely the highlight. A: The terrace in front of the Palestra because it’s a great place to socialize. M: Lanterna because the views are so beautiful. My room is in Lanterna, and it has such a great view of the lake. H: There is a table in the shade surrounded by trees. My friends and I always hang out there. A: I love the sports, especially CrossFit. M: I also like CrossFit. A: I love extreme water sports and being outdoors, so I really liked canyoning, rafting, and caving. M: The trip to Zurich because it is a beautiful city and there was so much to see and do. H: Milan because we saw important buildings like the Duomo and it was a lot of fun to explore the city. What do you like most about Lugano? A: The views are amazing. 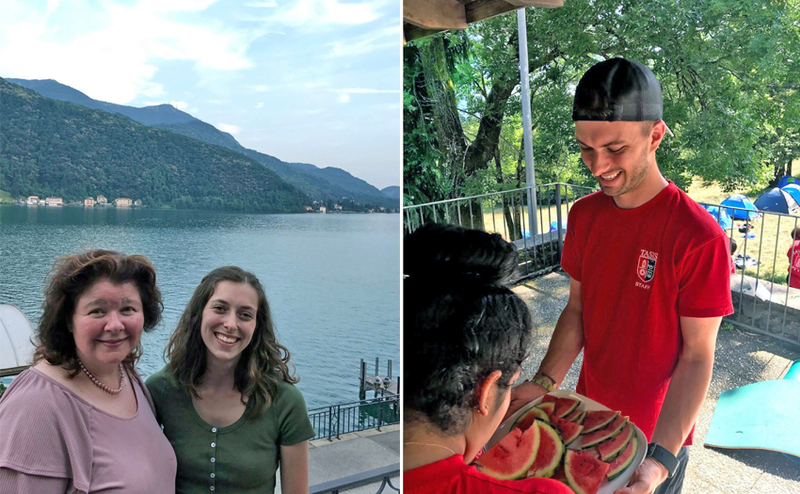 M: I love the views, but Lugano also seems to have a perfect lifestyle—it’s so peaceful. H: Even though it is small, it is still a city and there are many things to do. Shane Harvey is from the US and is spending his sixth summer as a CDE counselor. Olivia Goldberg is also from the US and has been a CDE counselor for two summers. S: I really like the experience that the students get coming here and meeting people from all over the world. O: I like that the Summer Programs bring together so many kids from different backgrounds. 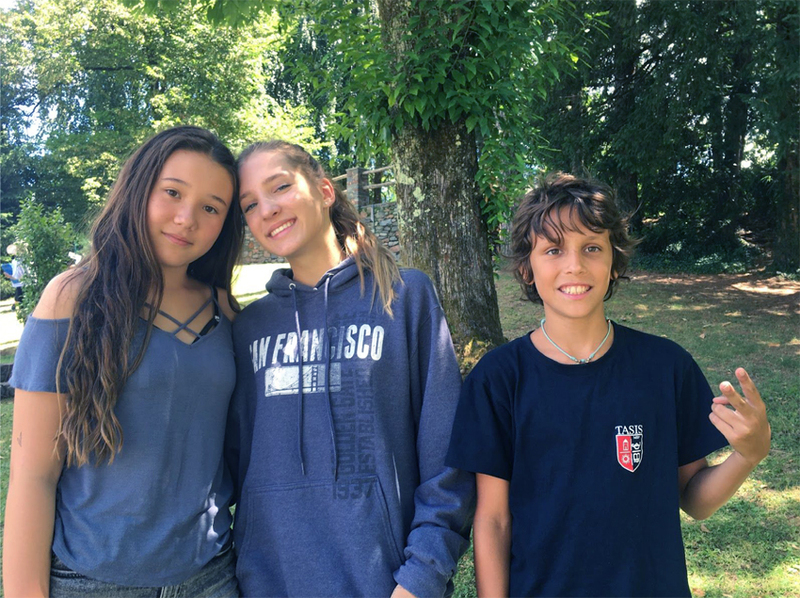 Some kids have been at TASIS for years and some are sleeping away from home for the first time, but by the end of each session everyone has learned how to work together and support each other. It makes me so happy to watch these kids learn so much in such a short period of time. S: I don’t have one favorite spot. The campus has grown so much over the last couple of years. I think that when you are living in the United States and you come here to work, you just look forward to being on campus because it’s so beautiful. O: Belvedere! There is such a beautiful view of the lake and the mountains. S: Our evening activities at CDE are my favorite because the counselors really get into it. We had counselor hide-and-seek the other night where the counselors hid around campus and the kids had to try to find us. 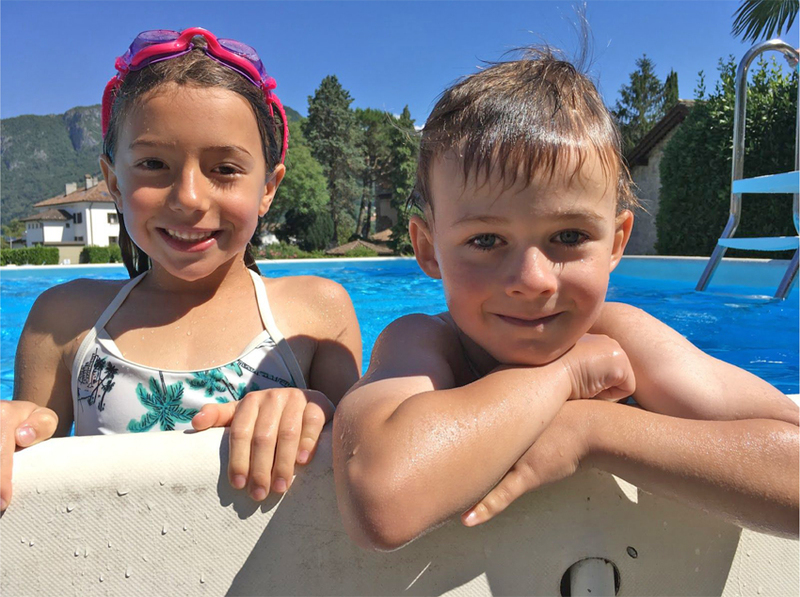 We take the kids bowling, night swimming, shopping—it’s a whole mix of a lot of different activities. O: I love swimming with the Minnows. S: We went to the Sensory Park this year for the first time in Parco San Grato. It was nice because the kids got to use their English to guide each other through the park, and we had lunch together and went swimming. O: Two of my favorite trips have been to the Bellinzona castles and the Museo in Erba. Why did you choose to come to TASIS for the summer? S: It’s a great way to travel and work, and you also get to meet many different people. All of the kids are amazing and we get to establish relationships with people all around the world. O: Half of my family lives in Lugano, and I love being able to spend the summer here exploring with the kids. It’s such a unique work experience because Lugano is like a little paradise!